Cyclists and adventure holiday seekers from all over the world are being invited to sign up to the Angkor Wat Bike Race & Ride presented by CIMB Bank. The event, organised by Village Focus International, will take place on Saturday 3rd December, and allows travellers to experience Siem Reap’s magical temple complex at a unique time when the Angkor roads are closed off to traffic. Village Focus International and CIMB Bank are hoping to raise over US$50,000 (net proceeds) this year and beat previous participation figures. 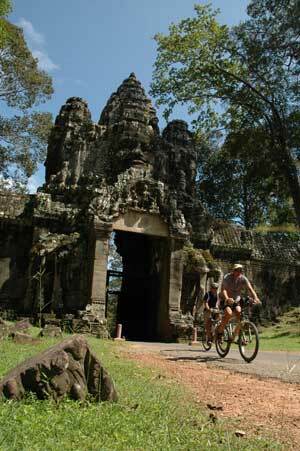 The Angkor Wat Bike Race & Ride is entering its sixth year this year. Last year 400 participants took part and organisers are expecting 600 this year. In 2010 participants from over 25 different nationalities took part. For more information on how to plan a visit to Cambodia timed to participate in this fun event, contact us now at Symbiosis Custom Travel.